My question for you this week is: How many siblings do you have? I have two of the best sisters a girl could hope for and I'm thankful for them every day. Of course, we didn't always get along when we were growing up. But, I was always glad there was someone around who knew me so well, and understood exactly where I was coming from. Of course, that can be frustrating too, lol (especially as a tween or teen). Looking back, I can't imagine life without them. And their love and support of my own family now is such a precious gift. How about you? Do you have siblings? Are you close? Thanks for visiting today! 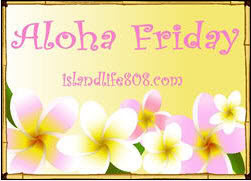 Your comments make my day :) Be sure to stop by An Island Life for more Aloha Friday fun. Have a fabulous weekend! I have 2 sisters and 3 brothers. I have two siblings, both younger; a sister, and a little brother. I didn't always like them when I was a kid.. annoying comes to mind lol Always wanting to play with me or get into my 'stuff'. But now, now that we're all grown up with families of our own, I love them both dearly. I am so grateful for the amazing memories I have of our childhood together. I have 2 sisters and 4 brothers. I'm the youngest. We're all pretty close, but it's kind of funny, because I'm closer to the ones that write blogs/text/Facebook! i have a sister 2-years younger than me, and we grew up together. She's my bestfriend. I have a brother 12-years younger than me, he's now almost 20-years old, but he'll always be my baby brother. I miss them so much! 1 half sister and 2 half brothers. I also have 2 sisters. I'm the youngest. I have 1 younger sister. I am the eldest of 9, so I have 8 younger siblings. 5 brothers, 3 sisters. I have 2 sisters and a brother. I have 3 sisters and 1 brother (he's the baby of the family! ).